Donuts bring happiness to life! …Unless you've made the switch to a grain-free, low-carb lifestyle! Then the lack of suitable donuts might make you quite sad. My family celebrates the Biblical feast days. While you won't find Hanukkah in the Bible, it's a Jewish holiday that we enjoy celebrating anyway. Known as the Feast of Dedication, Hanukkah commemorates the Maccabean Revolt in the 160s BC, when the Jews took back the Temple in Jerusalem from the Seleucid Empire. One story associated with this feast is the miracle of the oil. You see, there was not enough oil to keep the lamps burning, yet by a miracle they were able to make the oil last 8 days. That’s why Hanukkah is celebrated for 8 days, too. It’s a wonderful time of using the light of the Word for searching our hearts as well as rededicating ourselves (our temples) to the service of God. While deep-fried Hanukkah donuts are amazingly delicious and decadent… sometimes a lighter treat is in order, right? This is especially true if you’ve been feasting on a lot of fried foods for several days. There's no way “traditional” Hanukkah donuts are on-plan with Trim Healthy Mama. Nope. Not by any stretch of the imagination! That means we need a low-carb, grain-free, donut-inspired treat that incorporates olive oil in some way. 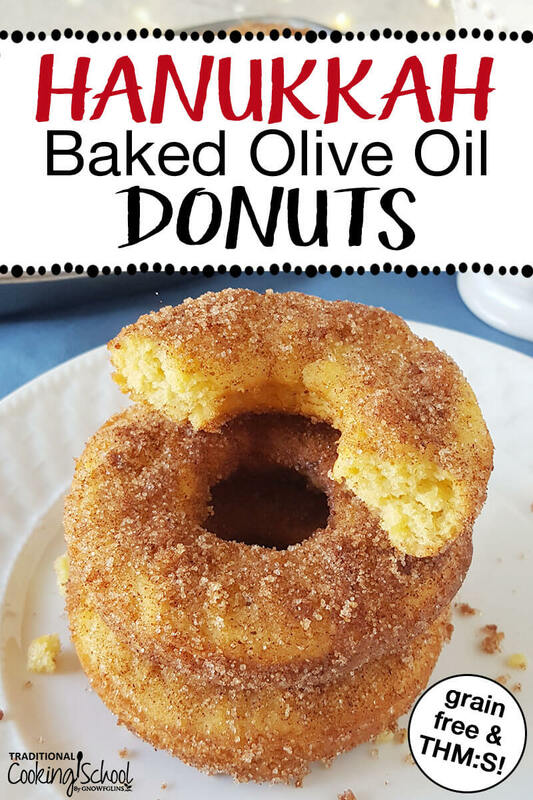 Hence, the birth of these delicious almond and coconut flour-based keto donuts, bathed in olive oil then coated in a delightful spiced sugar alternative. It’s got the taste of a cake donut with the satisfying crunch of a “sugary” coating — yet it won’t spike your blood sugar! In addition to brushing each donut with olive oil before rolling it in the spiced “sugary” coating, I also added olive oil to the donut batter. My crew isn't keen on a lot of olive oil flavor, so feel free to brush your keto donuts with melted butter or coconut oil instead, if you prefer. However, if you love the taste of olive oil, I highly recommend it! I wasn't sure olive oil + cinnamon + nutmeg + allspice would be a good combination the first time I tried it, but surprisingly, it was delicious! While I can’t quite put my finger on why these flavors work together, they really do. There are both commercially available and DIY sugar alternatives that work well in low carb baking. Typically, they combine pure stevia extract with either non-GMO xylitol or erythritol. However, I discovered that the best coating here is definitely just erythritol. The addition of stevia left a bit of a bitter aftertaste. We don’t use xylitol in our house because we have dogs and don’t want to risk accidental poisoning. Certainly feel free to try it if it’s your preferred low-glycemic sweetening option. Learn more about xylitol here. These low-carb Hanukkah donuts are not overly sweet on their own, but really don’t need a lot of extra sweetness to be delicious. Even plain they are quite tasty! Hanukkah is famous for fried foods like donuts. Yet what if you're grain-free, keto, a Trim Healthy Mama, or just looking for an easy healthy treat? 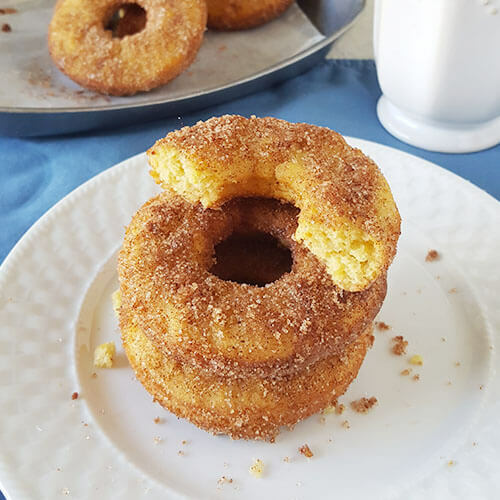 Traditional Hanukkah fare gets a makeover in this recipe: Keto Cinnamon Baked Donuts! They're the best homemade Hanukkah donuts ever, with gluten-free nut flours, olive oil, and a spiced, crunchy sugar-free topping that your entire family, kids included, will love. Grease donut pan very well, even if it's non-stick or silicone. Almond flour-based batters are more sticky. Set aside. In a mixing bowl, whisk together dry ingredients until completely incorporated. Be sure to break up any lumps of nut flour. Add wet ingredients to the dry ingredient mixture and mix well. Allow the batter to sit for a few minutes to allow the coconut flour to absorb the liquid. If batter is too thick, add additional liquid in small amounts until a loose muffin batter consistency is achieved. Divide batter among the wells in your donut pan. For 12 donuts, use about 1-1/2 tablespoons of batter. If any batter remains, be sure to divvy it up evenly. Bake in your preheated oven for 20 to 30 minutes, or until tops are beginning to brown, bottoms are nicely browned, and donuts are beginning to pull away from the sides of the pan. While donuts are cooling, mix together erythritol, spices, and salt in a small bowl. Once donuts are cooled, gently remove from the pan by using a thin knife or spreader to loosen, if necessary. Gently brush each donut with olive oil (or other melted fat of choice) then roll in Spiced “Sugar” Topping. 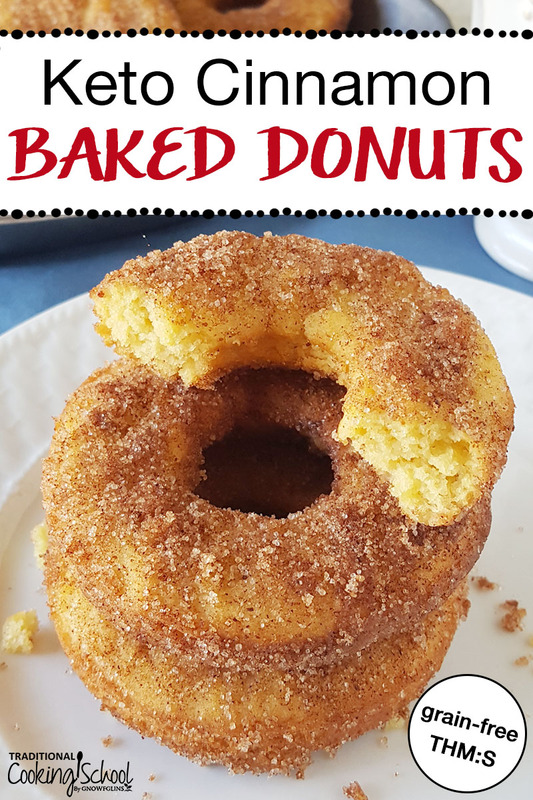 Will you try these Keto Cinnamon Baked Donuts? Did you ever think Keto Donuts would be possible?! The Feast of Dedication IS in the Bible- Jesus Himself celebrated it. Thank you for informing people. I knew that Jesus celebrated Hanukkah ?- God bless . If you don’t have the donut pan is there any other options, like a muffin pan with paper liners, or a square Pyrex dish? I think this might affect the time, though? Any suggestions welcome. So glad to hear you are keeping the biblical feasts also. This recipe looks delicious and I will eventually try them. My daughter, for whom I bought a lot of gluten-free ingredients, took them all when she went away to college, so I cannot do it right now! I think they’ll work great in a pan I bought that is like a muffin tin but it has square holes instead of round ones. Thank you for this recipe! We eat this way because of health issues and just in time for Hanukah! Thank you and may Jesus keep blessing you and your family. Sounds delicious! Thank you, Dawn. I’m hoping to give them a try, and may also try drizzling the cooled donuts with a chocolate topping made with raw cacao powder, raw honey, vanilla extract, and enough liquid to make a sauce-like consistency. For the liquid I’ve used a bit of coconut oil, or almond milk, or unsweetened pineapple juice. A combination of liquids also works well. There is no set amount of any ingredient; my recipe is tailored to taste and desired consistency. It’s a healthy and delicious (and super easy) chocolate! Thanks again! 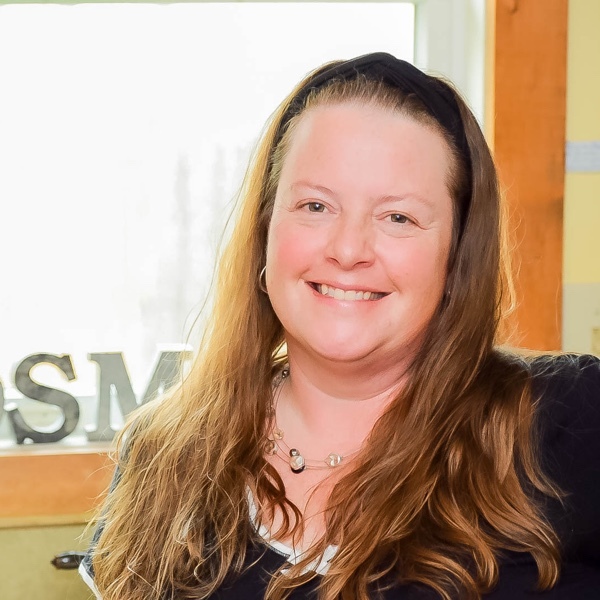 Maureen, I use only fruits, spices, raw honey or pure maple syrup for sweeteners. I’ve been sugar-free for 4 years, and love it! Foods taste so good and God’s natural sweeteners actually have flavor, rather than just flat sweetness. Anyway, if you use a liquid sweetener like honey or pure maple syrup you do have to cut back a bit on the other liquids. 3/4 cup honey or maple syrup equals 1 cup sugar. Reduce the recipe liquid by 3 Tbsp per cup. Also, reduce the oven temperature by 25 degrees to avoid burning. I eat eggs so I can’t address your egg substitute question. Hope you get an answer from someone. Hi Maureen! I used to do quite a bit of vegan baking (savory + sweet both) and have tried all of the substitutes described in the article linked below with reasonable success. I found soft tofu the best for sweet treats (flavorless and sturdy) — as long as you’re OK with soy — but be sure to press out the excess liquid and purée it well to eliminate lumps. Good luck and God bless! Can these be made with coconut flour? My son is allergic to almonds, eggs and gluten intolerant so baking is difficult! I would also like to know seeing as these are called “keto” … Would at least like to know the carbs. Thank you for sharing this recipe-they are delicious! I did not have a donut pan, so I made them as muffins. I used avocado oil instead of olive oil. They turned out great! One story associated with this feast is the miracle of the oil. Just not “traditional” in the Traditional Cooking School sense of the word.